Many space stylists make generous and nonchalant use of the term “Art Deco” in their often mystifying discourses on interior design. In this article we’ll uncover the veil of confusion that often envelops this design style. This may encourage those who seek a distinctive post-modern look to their space - in either a fun or sophisticated fashion - to consider the delights of Art Deco tiles. The Art Deco style, although we usually recognise it intuitively, is notoriously difficult to define. It’s really a fusion of different styles, influences, and vibrant colours - with particular deference paid to geometric shapes, symmetrical configurations, and exotic cultural motifs (often botanically or meteorologically inspired) from lands of antiquity. The style originated in France in the 1920’s, named after the 1925 Exposition Internationale des Arts Décoratifs et Industriels Modernes. It was born in the era of hope that followed the Great War, and matured in the period of unbridled optimism that followed the great depression. Thus it’s no surprise that the Art Deco style conveys luxury and magnificence. From its birth in Paris, Art Deco was swiftly embraced globally, and rapidly came to influence countless disciplines including visual arts, film, fashion, interior design, and architecture. Many of the signature buildings built in New York in the 1930s - such as the Chrysler Building and Rockefeller Centre - were inspired by the Art Deco movement and evince the strength of this embrace. Although Art Deco draws its inspiration from past art movements, one of its most outstanding characteristics is its orientation towards the future and its celebration of technical progress in the modern age. This is particularly evident in its fascination with almost all modern materials including cutting-edge metals, plastics, and ceramics. And it is its fascination with ceramics - allied to the fact that above all it is a decorative style - that has usTile Devil so keenly interested in Art Deco design. The last decade – surely the decade of most rapid acceleration in technical progress in the history of our planet – has coincided with a dramatic rise in demand for the innovative glamour of Art Deco interior design. 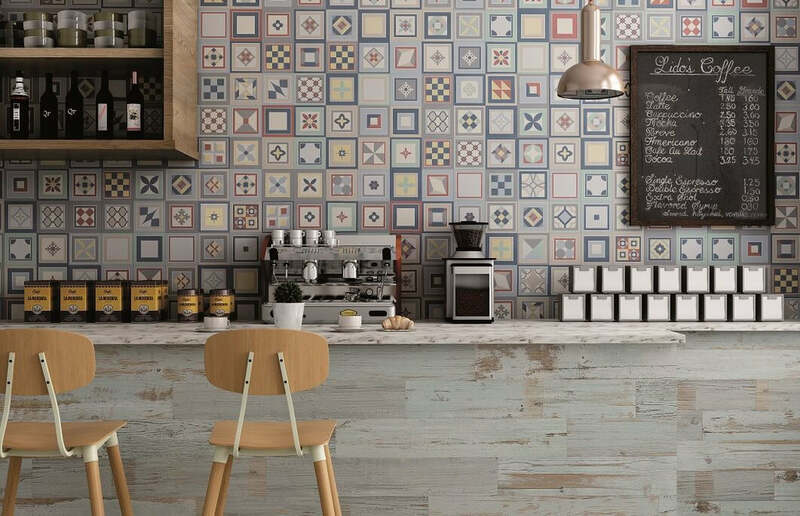 Tiles with striking colour schemes and an eclectic mix of geometric, floral, and astral patterns are increasingly found in British homes, Parisian apartments, New York lofts, and Soho cafés. 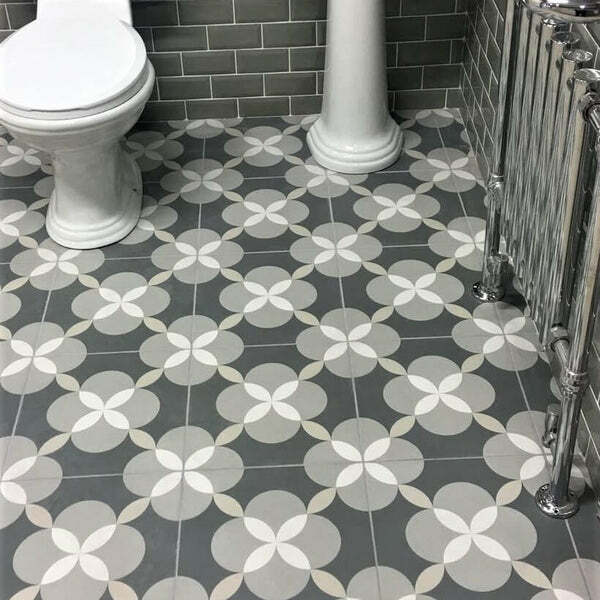 Geometric patterns are often used as decorative borders for tiled walls or floors, and the wide variety of colour schemes available means that Art Deco tiles integrate beautifully and seamlessly into almost any space within homes and retro-trendy commercial spaces, in either urban or rural settings. 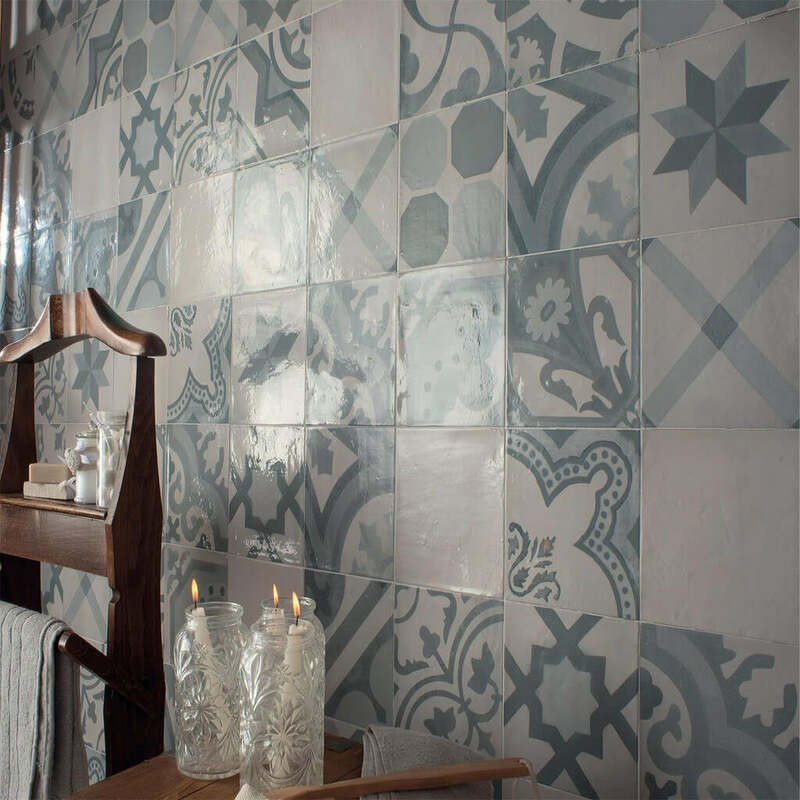 They’re equally delightful as both floor or wall tiles, bestowing a distinctive post-modern character that can range from fun to sophistication. The raw allure of such Art Deco motifs is almost magnetic. Dynamic, vivacious patterns - whether in the form of floral bursts, geometric contours, or astral silhouettes - can tend to dominate a room and, true of all Art Deco, become the centre of attention. Thus it’s necessary to put considerable thought into the installation of such tiles. 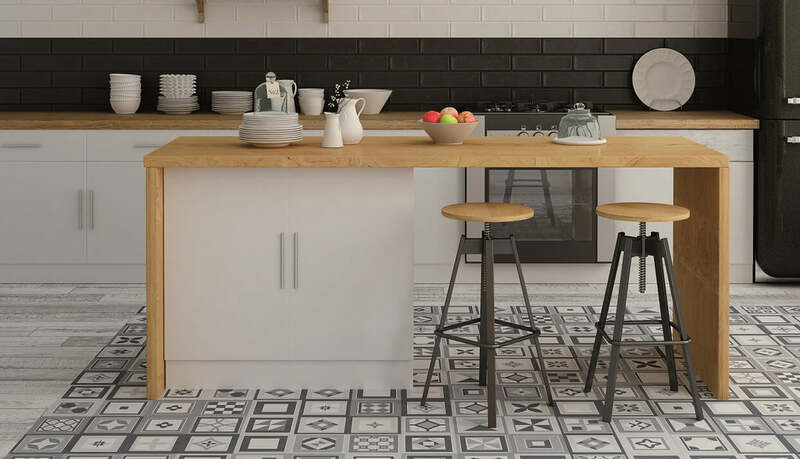 Many designers choose to adorn central parts of walls and floors with vibrant tiles, and to surround this critical space with more sober, monochrome tiles. By framing the Art Deco designs with neutral grey floor tiles, a natural centrepiece that is not overly powerful is fashioned in the room. Note how the cream wall tiles complement this floor design in a wonderfully subtle manner. Our Antique collection of whites and aquas offers another subtle application of Art Deco decoration. The melange of patterns and motifs, allied to the authentic hand-painted appearance of each tile, evokes hints of antiquity that is one of the hallmarks of the Art Deco movement. 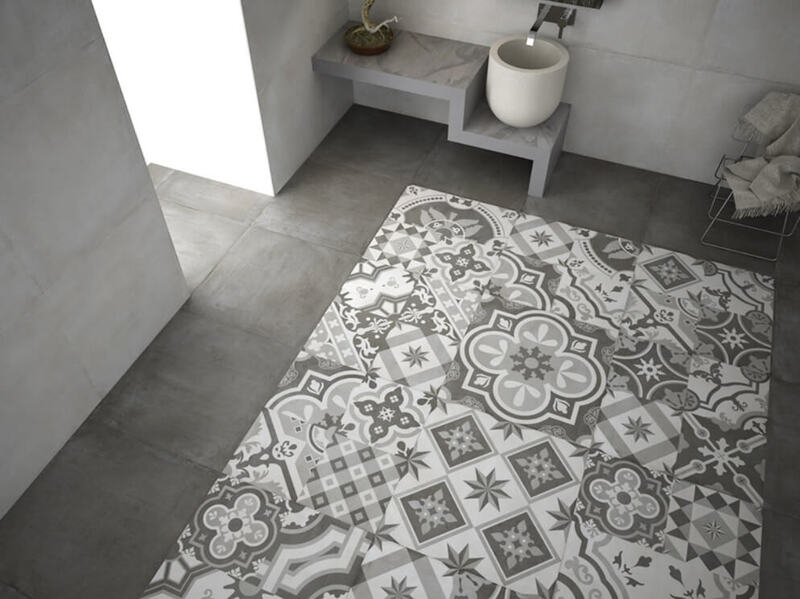 Our superb Atelier Geo tile is another restrained range that lets the patterns speak for themselves. Its strength lies in its geometric simplicity, and this is where it offers an alternative entry point into the delights of Art Deco. Application opportunities for this terrific tile are countless. 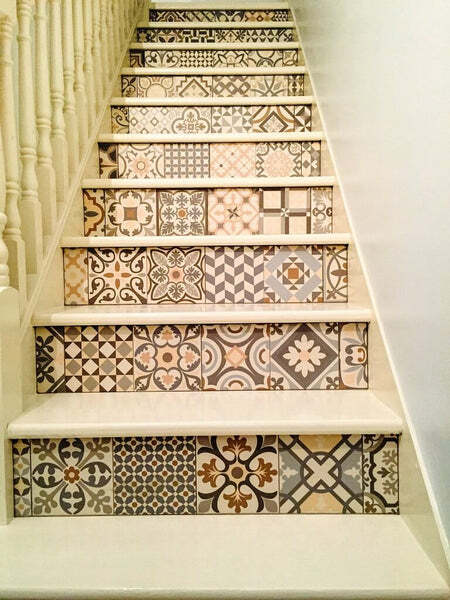 Art Deco tiles can also be used to stunning effect in hallways, as demonstrated by the delightful staircase below. One of our customers enlisted a skilled tiler to fashion this gorgeous vista using our Heritage Mix floor tile. The sense of confidence that exudes from the simple staircase impresses itself on all visitors to this home, adding a certain touch of distinction and je ne sais quoi. And if confidence is what you want your interior decoration to suggest, make sure to consider our Moments Mix range. This stunning selection of vibrant colours and patterns allows you create striking statement pieces which will assert individual personality and style within your home. Art Deco is one of the most influential, contemporary interior design styles. 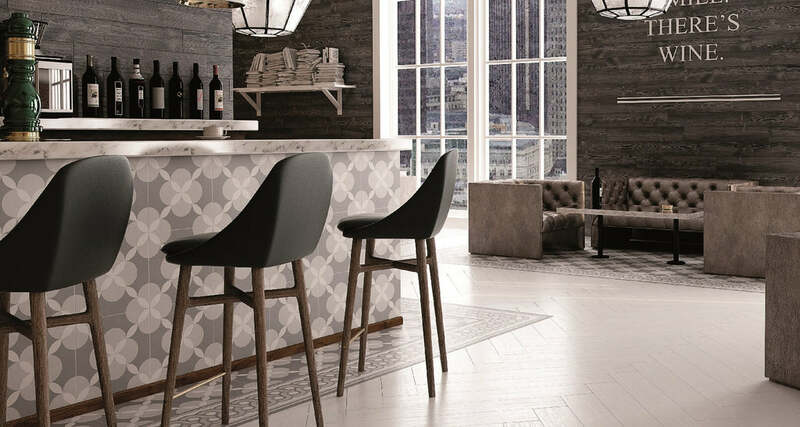 If you wish to introduce a striking statement into your home or commercial space, a personalised approach that exudes confidence and conveys a distinctive post-modern character in either a light or sophisticated manner, then invest some time in Art Deco tiles. You’ll not be disappointed.